For some churches, the idea of a newsletter might feel dated. But the truth is, if they’re done well, newsletters can still be an effective communications tool. That’s the case for Juicys winner Knox-Met United Church in Regina, SK. The Canadian church of 125 members recently re-launched a newsletter after several years of hiatus. But instead of the boring black and white version of the past, this round features modern, clean, full-color design. 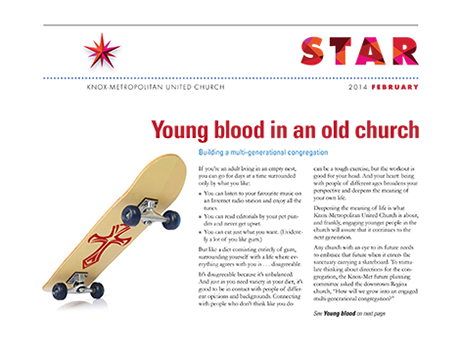 The trick was to find a design that appealed to the church’s younger members without alienating the older generation. Better still – the newsletter is working. Yes, younger people have told church leaders they’re reading the newsletters, which is also available as an interactive document. While closing the age gap in communications was a large goal, the biggest hope for Knox-Met was to use the newsletter to get people excited about the revitalization of the 125-year-old church. 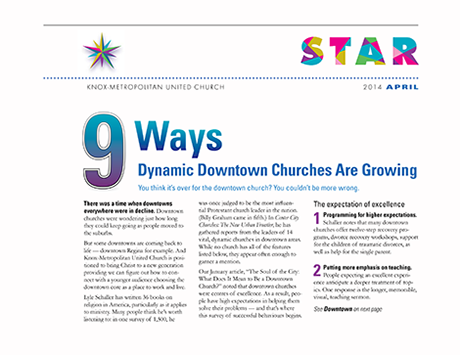 The newsletter featured church members’ stories while also creating interest in where the church was heading in being a better part of their community. 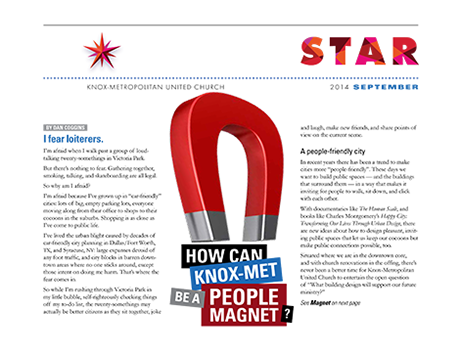 It’s also meant as a tool that can reach beyond the church pews to share the new Knox-Met with neighbors. In the end, focusing on the vision of being a better community member has also helped Knox-Met be a better communicator. The next necessity to focus on for Knox-Met is a new website. 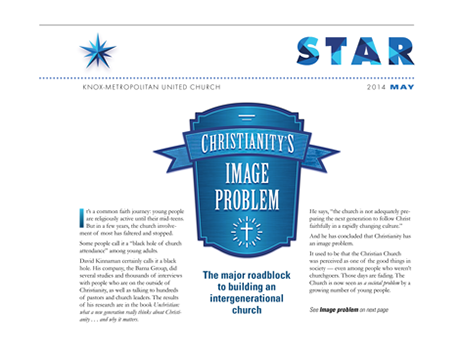 The church hopes to bring the same fresh look of their newsletter to their online presence.